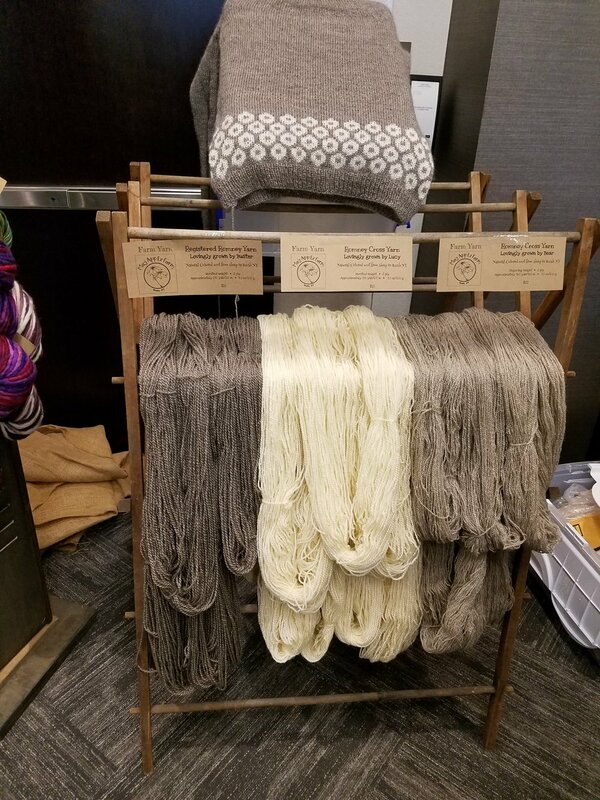 Yarn Fest 2018 in Buffalo NY! Yarn Fest is yep you guessed it, a yarn and fiber sale hosted by the Knitting Guild of Greater Buffalo every year. According to their Facebook event page it is a "Premiere event for those loving yarn and fiber related items." That's pretty much me. So I went this year for my first time. It was an awesome display of mostly yarn and some fiber by talented indie dyers and spinners form New York State and Pennsylvania. The bulk of the event took place in one of the meeting rooms at the Hyatt Place Hotel in Amherst, NY. But my favorite part of the event was just outside in the parking lot. There was a yarn truck! I just think that is the coolest thing. Maybe I live a sheltered life over here to 1. get that excited over a traveling yarn truck and 2. not know that they existed. The truck is owned by buffalo native Jenna of Knitbuffalo. 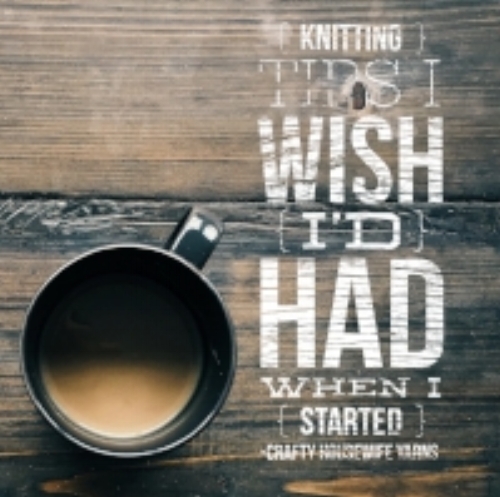 She's an extremely talented knitter, spinner, dyer, and all around sweet girl. I took a few photos in the truck but it was a little tricky because there were so many people clamoring to get in and shop. Check her out on her website . It has all her events listed so if you're ever in the area you can go see her in person. She told me a secret that I can't divulge about one of my very favorite knitwear designers coming to Rhinebeck this year and possibly doing a small local event with her just prior. That will also be posted on her events page closer to the Rhinebeck Fiber Festival. If you're interested in online shopping for her squishy goodies take a peek at the site ! I'm a huge Buffy the Vampire Slayer fan and she had a few colorways named with quotes from the show. I love finding a fiber friend who has the same geeky interests as me. Moving along inside there was a table set up for people interested in joining the Knitting Guild of Greater Buffalo. I've been told they have something like 200 members which totally intimidates my introverted self so I did not check them out. I should though because resources! Then in the next room over was the main part of the event. There were many vendors set up with such beautiful yarns and fiber. I purchased a beautiful skein of a lusterous alpaca blend in a dark navy color from Golden Oak Farm. The yarn base is called Astral and every single colorway they had it in was gorgeous. I had a hard time picking just the one. You can check them out at www.alpacasetc.net. It came with a one skein pattern for a cowl that I can't wait to knit up. I have to finish the mkal I'm currently working on though first. And I also purchased a stunning skein of hand dyed roving from The Spinning Bunny. Is roving in a skein? The color is called Aurora Borealis and it is to die for. I can't wait to spin it up into some chunky art yarn and weave something with it. Click here for the Spinning bunny etsy shop. click picture to grab this great free pattern. I would recommend any of the bulky weight or chunky weight yarn from our site. There were just so many beautiful yarns and fibers there. There was even one woman selling chicken items there...like chicken feathers in a mason jar with a chicken-y print fabric on the lid. And she was selling pictures of her chickens as well. My mom used to have a chicken theme in her kitchen when I was growing up and I almost bought a jar of feathers as a joke gift for her for Mother's Day...I decided to be a good daughter and get her a flamingo shaped bird house to hang in her garden instead. All in all I think it was a very successful event. I love supporting the fiber community and small businesses. I hope you all can go and enjoy fiber related events in your community and support people doing what they love! Plus you never know what goodies you will find. There are so many talented people out there in the fiber world that are hidden gems. Go out and find them! While impressive patterns and sweater knitting has it's appeal, sometimes you just have to accept that you need to make something simple. Upon arrival in our new lives I was very excited to get going again with my business. I'd really missed it, the creative planning and the feeling of accomplishment but I was total brain dead. I feel like this winter has been really tough on most people I know. My friends in WA state have literally been snowed into their houses for around a month. I can't even imagine being trapped in a house with my kids for that long. I have put my handspun sweater on the shelf and have been diligently working on projects people have been requesting. I had started to notice a theme, they were all cute, practical and multifunction accessories. I have been making "messy bun hats" and "Toeless Yoga socks" They both keep you warm and feeling comforted while hopefully lifting your spirits a little. I know with the new year people are normally trying to be healthy and thrifty so this seemed like the perfect time for affordable easy care items. I know my personal new years resolution was pretty simple. It was to stop caring around a dirty diaper bag ( really a travel toiletries bag) and carry an actual grown up lady purse. I managed to accomplish it by jan 1st and have been happier every time I pick up my new purse( lets be real new from the back of my closet). So that's been my theme so far this year is self acceptance and spending a little extra money and time on simple hardworking luxuries. I got my hair dyed by an actual professional so that my roots will hopefully look more rock and roll and less tired mom. Between that and some new t shirts curtesy of Etsy and Target and some new make up from a friend's website I'm hopefully looking more like a person. So that was my new leaf for the new year, sounds kind of vain I know but damn it I needed a little more vanity in my life after two babies and an epic move. So back to the yarn. The yoga socks are made from commercially spun hand dyed yarn, They are beautiful and soft while having just a touch of nylon for durability and easy care. I know I always hate to have cold feet at the end of a yoga session but bare feet are a must for not slipping. Also in SC I know most people refuse to stop wearing they're flip flips regardless of season. The hats are also from a nice wool acrylic blend so that they can be easily hand washed and are affordable. The messy bun has become the fashion staple of the hurried mom or pumpkin spice latte carrying 20 something alike. While it is the perfect solution to many bad hair days it's not so practical if it's cold and you can't wear a hat. So this is the perfect solution. There are many different types for sale I found this pattern and thought it was simple and would be comfortable and look nice with many different outfits with out looking to over done. Not that I've forgotten about handspun, When I got my shop back up I included "freezing fog" a silky soft merino wool and camel hair blend. due to it's high end fibers it's very lux while still being understated and clean at the same time. It would look great knit into a simple scarf for cowl and worn with a brightly colored jacket to beat the winter blues.